After having seen how you can overclock your processor to make it run at a frequency higher than the stock frequency, we will try to look at how you can overclock your graphics processing unit. 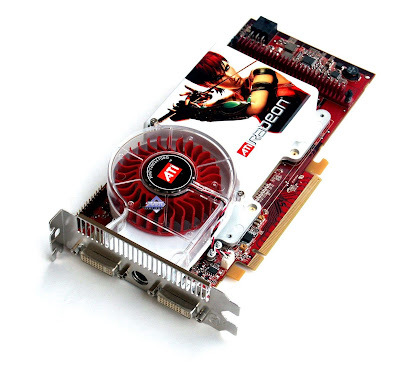 Graphic cards have two main parameters namely: core clock and memory clock. Core clock is the speed at which the graphics processor in the card operates. Memory clock is the speed at which data is transferred between the processor unit and the VRAM - the graphics memory. Memory clock along with the memory bus determines the memory bandwidth of a card. Higher memory bandwidth means you can crank up the anti-aliasing and anisotropic - filters. Overclocking the GPU involves playing around with the clock speeds of the core clock and memory clock. Unlike processors, graphic cards, although manufactured by giants like NVIDIA and ATI, are sold by third party resellers. Many resellers like XFX, Zotac, etc., play around with the clock settings to make their products stand out. So, although there may be reference settings for a particular GPU, you will find various flavors in the form of different video RAMs, different clock speeds, etc. card's warranty as you are trying to make the card work at a setting which is higher than what you were offered. Overclocking is a risky sport and may end up harming your graphics card if not done with care. The main reason why manufacturers rate the card at lesser their maximum performance limits is to allow the card to work under the worst possible conditions stably. There are two ways to go about overclocking your GPU: by using software utilities or by flashing the BIOS. We would suggest you try over-clocking by using software utilities as it is a completely reversible process, unlike flashing the BIOS which is a bit complicated and should not be attempted without determining the card's threshold using software utilities. 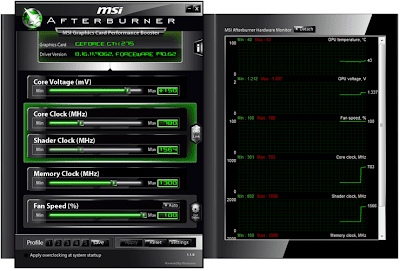 Riva Tuner, ATI Tray Tools, MSI Afterburner are the software utilities that allow you to overclock your GPU. Riva Tuner works with both NVIDIA and ATI cards whereas ATI Tray Tools works with ATI cards. All card manufacturers also come out with their own software CDs which have utilities for overclocking like Catalyst (for ATI cards) and nTune (for NVIDIA cards). Start off by installing the utilities on your system. 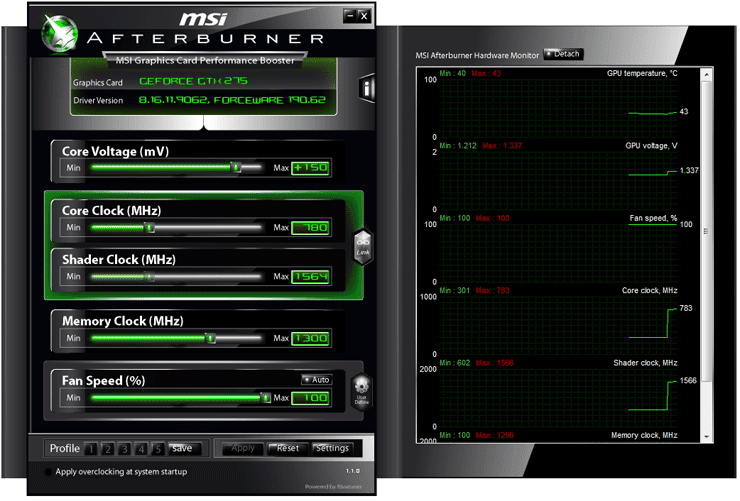 We are using the MSI Afterburner. In the NVIDIA cards you have an option to slide the core clock, shader clock and the memory clock. In an ATI card you can only adjust core clock and memory clock. In both the cards, one can also adjust the fan speed. Keeping the temperatures under check is important as overclocking will lead to a rise in temperature. So in order to crank up your clock settings, your temperature needs to be under check. First move the core clock slider on the right hand side in small increments of 10 MHz each and stress test the system. This can be done by running benchmarks like your favorite games or synthetic benchmarks like 3D Mark Vantage, etc. Keep doing this till you reach a value where the stress test either crashes or shows some unwanted colors or artifacts or the system simply does not boot up. Try reducing the core clock and then start increasing the memory clock in increments of up to 20 MHz. Repeat the process that you did previously till you reach a level beyond which you start facing any problems. Perform all your stress tests again and get readings and see the improvement in your card's performance. Now note that since you are overclocking your card using a software utility, unless you save the overclocked Core and Memory clock, the card will start from the stock speeds when you restart your system. MSI Afterburner and so do other utilities allow you to save your clock speeds in the form of profiles. So next time when you restart your system, all you have to do is go in the software utility and enable your preset profile. This is the basic way to overclock your GPU. There are advanced ways to get even more performance out of your GPU by using external cooling solutions or hard modding your graphics card - by adding resistors and other components on the card. We will cover that some other time. For now, go ahead and get more frames per second and enhanced gaming by overclocking your GPU.